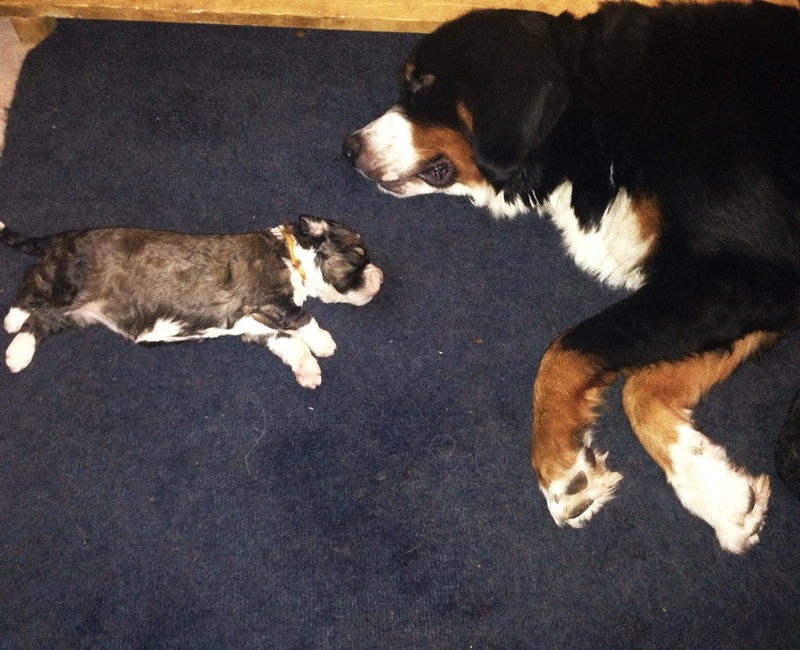 Our puppies are born in our home, and are handled from the very beginning. We have a double-sided whelping box, in case more than one of our breeding females cycle at the same time, and have puppies around the same time. We let the soon-to-be mothers prepare their "dens" for about a week or so before they are supposed to deliver. They seem to take great joy in getting their blankets "just so" on their side of the box. When our soon-to-be moms are in early labor, they are allowed to go wherever in the house that they can labor most comfortably. 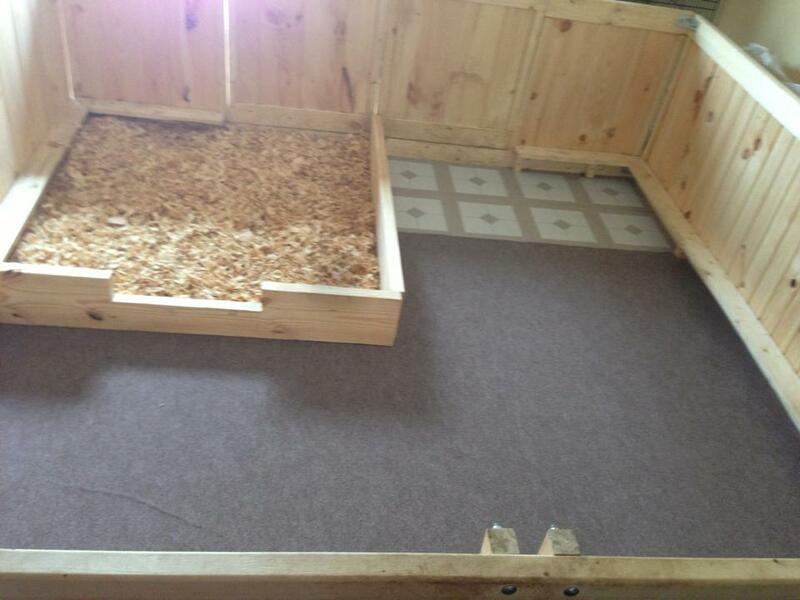 However, once they are in hard labor, they go into their "den," so they are ready when the puppies begin arriving. Piper, laboring with "her" pillow. 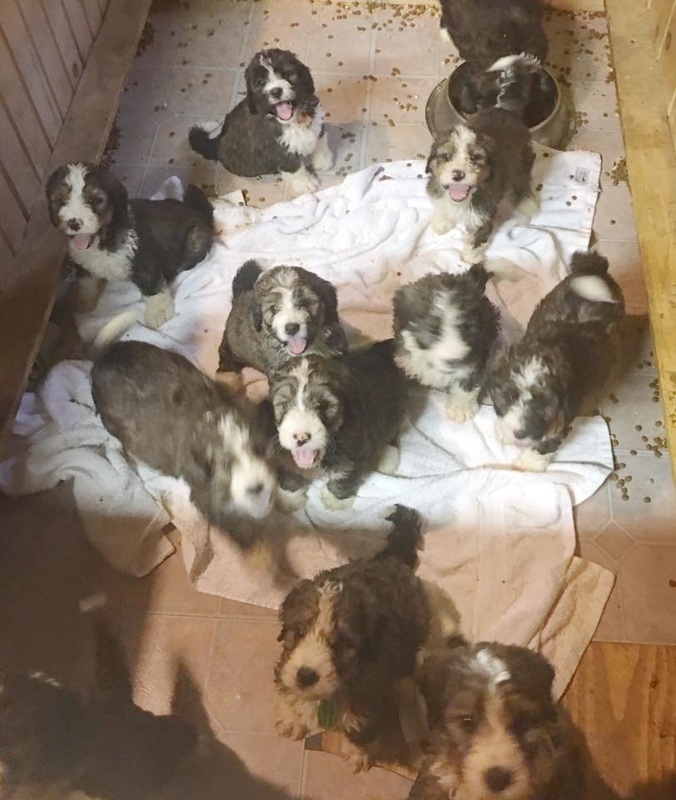 Each litter is born on their own side of the box, where the moms can have privacy from the other dogs, but where we can still help with the deliveries as much as is needed. When the puppies are three days old, we take them to the veterinarian for the first time, for a puppy exam and to have their dewclaws removed. 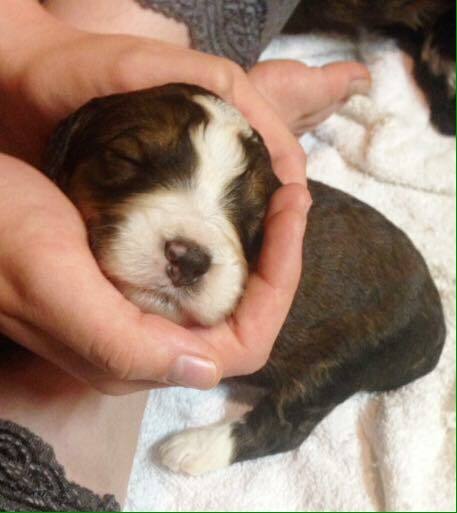 During the first week, we divide the puppies into two or three groups, with each group sleeping in its own box on a heating pad. We give the puppies to their mothers for feeding and care, but then they go back into the boxes with the heating pads, to keep them safe from accidentally being layed on by over-exhausted mamas. When the puppies are about a week old, we remove all of the blankets from the box, and put down a sturdy piece of carpeting, to offer them traction, to assist in proper muscle development. 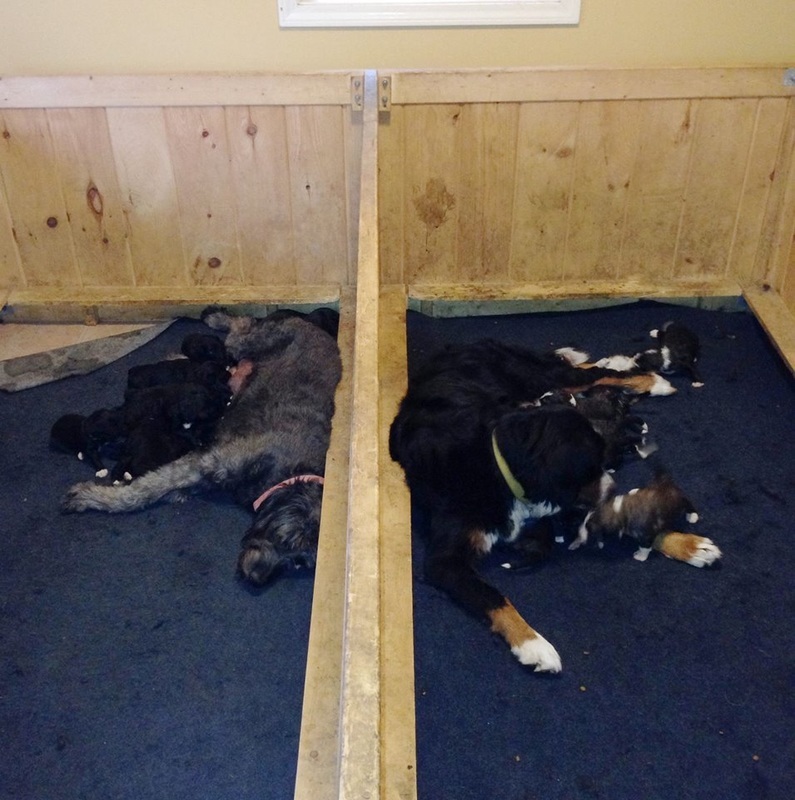 For the first three weeks, the puppies stay on one side of the whelping box, with their mother. During this time, one of us is always nearby, in case one of the sleepy mamas should accidentally lay on one of her new puppies. More than one puppy has been rescued by the vigilance of our children! 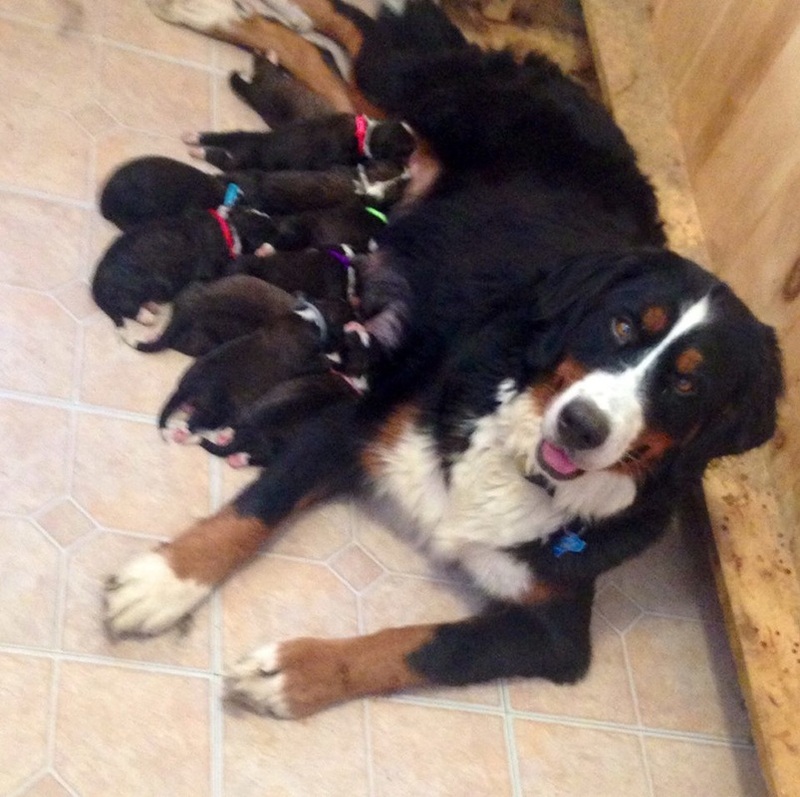 Proud moms, Bridget and Piper, with their beautiful babies. First-time mom, Piper, was so happy to finally have her own babies, after watching Bridget and Holly have them for so long. No more jealousy! The puppies are initially treated for intestinal parasites at about two weeks of age, to help them get rid of anything that might slow their growth. They will typically be treated another two times, to try to ensure that they are clear of parasites by the time they go to their new homes. We cannot guarantee them to be parasite-free, but we will do our best! 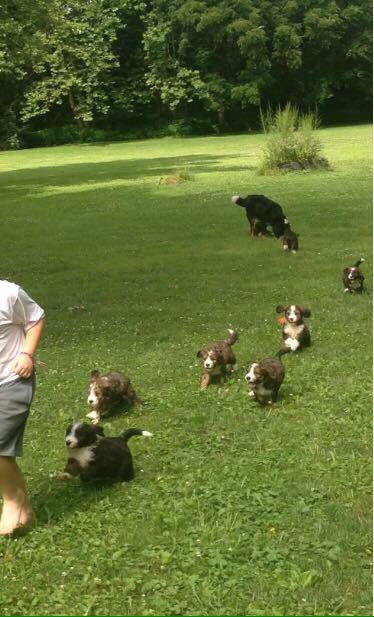 Two-week old Bernedoodle puppies. You can see the different coat colors---sable bi-color, brindle bi-color, and sable tri-color. Mommy can protect her from a lot of things, but not from parasites---so treatment has to start while the puppies are still young. When the puppies are about three weeks of age, we set up the potty area in the box, which teaches the puppies that there is a designated area for them to potty. They become accustomed to using the potty area very quickly, usually within the first couple of days. We use compressed pine litter in this area, for cleanliness, and so that when the puppy goes to his or her new home, their new owner takes home a small bag of (clean!) pine litter, to put in the yard, where they want the puppy to potty. Then, during house-training, they take the puppy to where the pine litter is, and the smell helps the puppy to remember what to do. By the time the puppy is trained where to go, the pine litter washes away with the rain, and what is left is a puppy who knows where to potty! We've had a lot of people have great results with this method! We remove the center wall when the puppies are about three weeks old, and if there is more than on litter, the puppies all get to meet each other. This is always fun, because the moms don't discriminate as to whose puppy is whose---they just love all of the puppies! 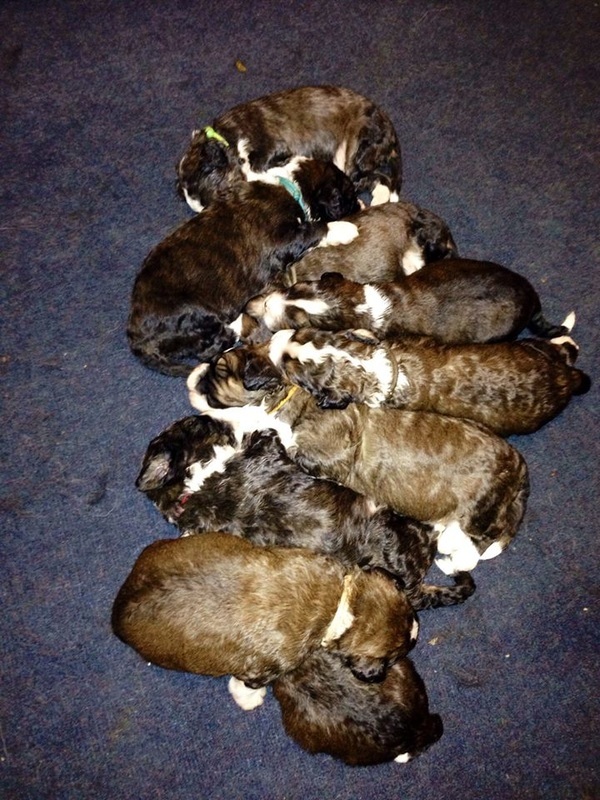 A litter of F1b Goldendoodles and F1 Bernedoodles, born just a week apart. They were best friends! 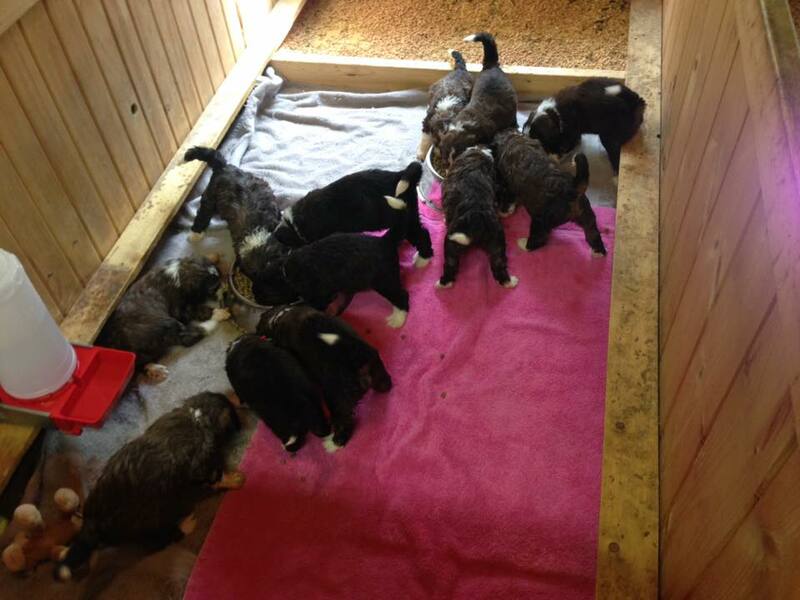 Bernedoodles eating their first meal of "puppy gruel" (dry puppy food, puppy milk replacer, and canned puppy food). At about five weeks of age, if the weather/temperature permits, we begin letting the puppies have some playtime outside. Since we live in Indiana, this isn't always possible, but when it is, the puppies and the moms love it! 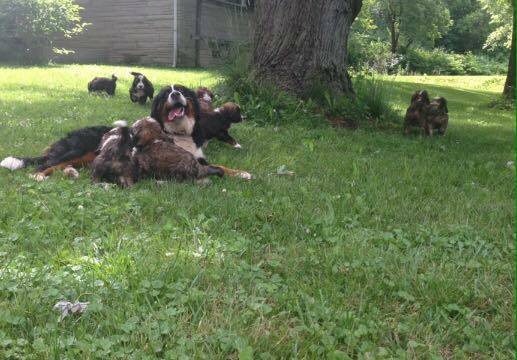 The happiest day of Piper's life---the day her puppies finally got to come outside with her! At six weeks of age, the puppies go to see the veterinarian again, so they can be examined to make sure that everything is great with them, before their new family chooses which puppy they want. At this time, the puppies are retreated for intestinal parasites, and receive their first round of puppy vaccinations. 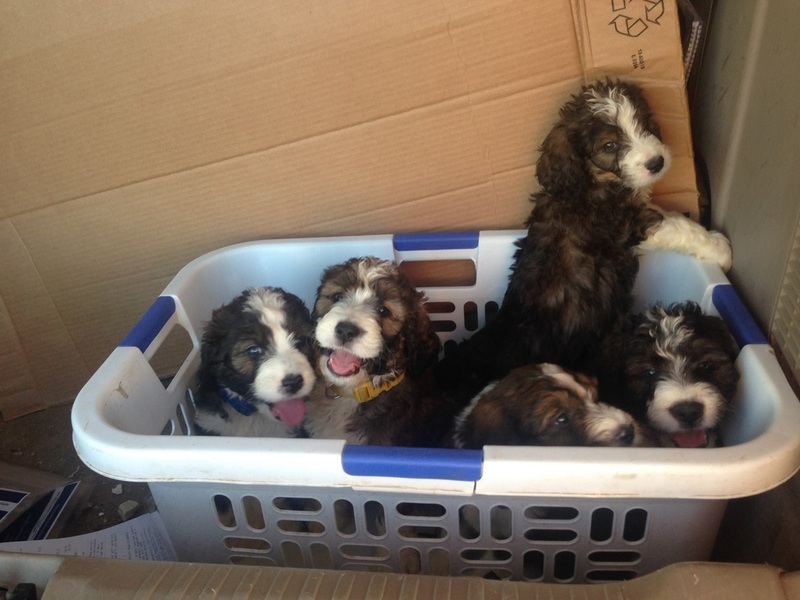 A basketful of cuteness, on their way to the vet's office! On their way to get their six month check-up and vaccinations! 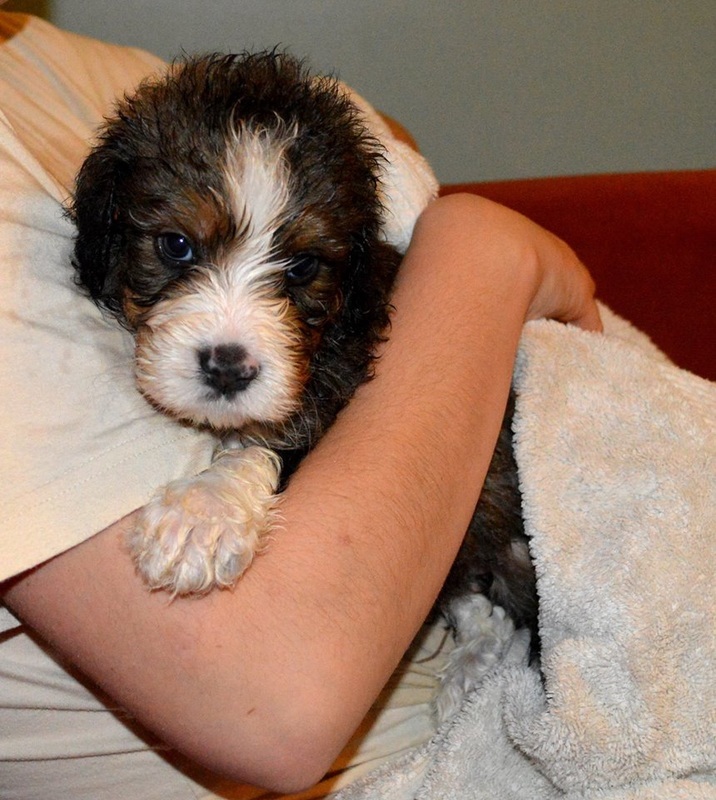 Our puppies are socialized with kids, adults, cats and other dogs, and get used to having baths. We try to ensure that our puppies have only positive experiences while they are with us. We work with the puppies to teach them what is expected of them, so that by the time they go to their new homes, they are often (not always, but often!) no longer exhibiting some typical unpleasant puppy behaviors (such as clothes-biting or hand-chewing). 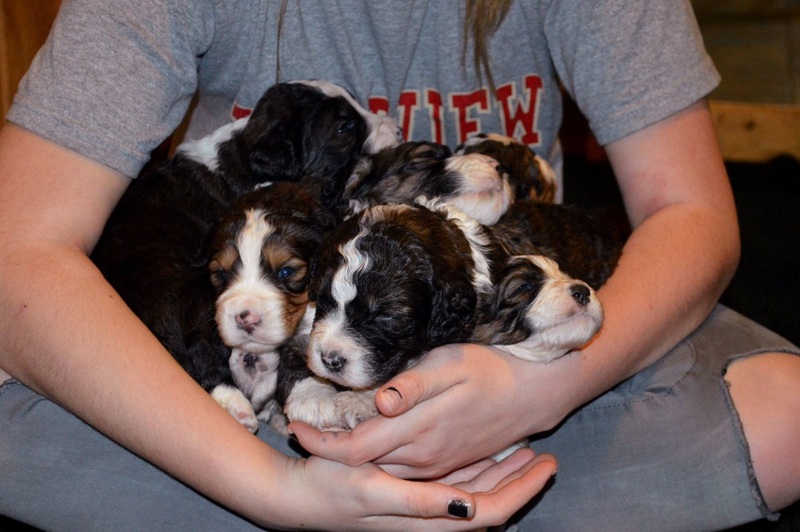 So many puppies, so little time---let's just hold all nine at once! 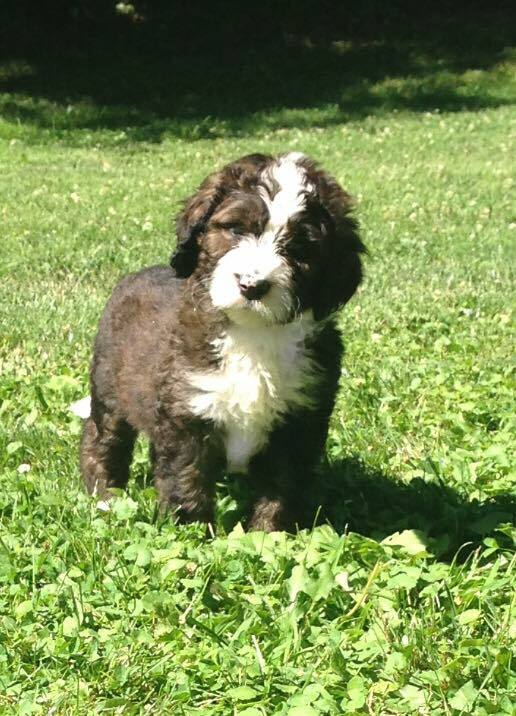 Ideally, we want to send home puppies who will grow to be well-behaved, calm, low-shedding dogs, who are great with everyone, highly adaptable, and ideal for therapy work. We have heard back from almost everyone who has purchased one of our puppies, and they all agree that the puppy fit perfectly into their family. That makes us very happy, because that is our number one goal!